A little ways back, John (W1MBG) discovered our Blog and approached us about doing a presentation for the Nashua Area Radio Club (NARC) on the design, construction and operation of our recently completed station. The NARC group invited us to their March meeting where we shared our presentation with the nice group of folks in the Club. I wanted to post an overview of what we shared as well as a link to the full presentation so that our readers can have a look at the material and hopefully benefit from the information that we have assembled. I have also used this post as an opportunity to create an index to all of the articles on this Blog related to the design, construction and performance of our station. Our new station project involved both the construction of a dedicated room for a new shack and a tower based antenna system. It took us about 1 1/2 years to build our station including the associated antenna system and we covered quite a number of areas during the project. Our presentation focused on some things that we did to plan and build our station that should be useful to many Hams building or upgrading anything from a simple station to an all out effort to create a state of the art multi-op station. I think that its important to begin a new or upgrade station project by thinking through and writing down the goals that you have for your new station prior to purchasing equipment or beginning construction. This step is important because it helps you to think through what you want to accomplish and serves as a high-level blueprint for making design, equipment selection and construction decisions as you build your station. 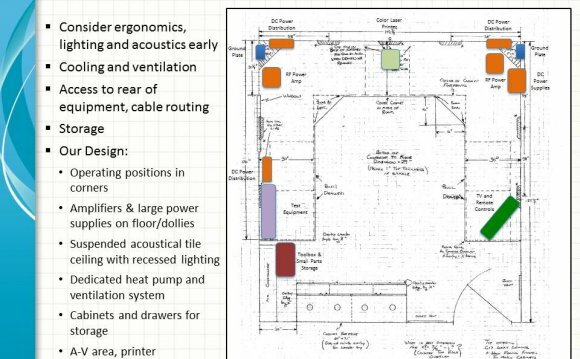 We put considerable time and thought into the design of the room and operating area for our new shack including many rounds of drawings and some “human engineering” to arrive at the final room layout. While not every Ham will build a dedicated room for their shack, some careful thought put into the layout of the operating and storage areas for your shack and the associated support systems is an important design step. The other major element in the design of our station was a new tower-based antenna system. We had some pretty expansive goals for the band capabilities and associated performance of our new antenna system and the presentation explains how we went about developing and executing a plan to meet our goals. Since the initial installation of our tower antenna system, we added an 8-Circle Vertical Receive Array for the Low Bands and we’ve reinstalled our SteppIR BigIR Vertical Antenna. These new antenna system provide important additional performance on the low bands and during contests. We’ve also added an Antenna System and Electronics for LEO Satellites. We’ve also installed an SO2R and Station Automation System from microHAM. The microHAM system enables much smooth and less error-prone operation of our station and enable SO2R and Multi-two operation during contests. Our presentation includes several slides which cover the construction of our new shack and tower as well as the feedline, antenna, power and other supporting systems. The end result of all of this work is shown via a few slides which provide a “Virtual Tour” of our station. Signal/One was a manufacturer of high performance SSB and CW HF radio communications transceivers initially based in St. Petersburg, Florida, USA.